This is it, the 1st birthday party. 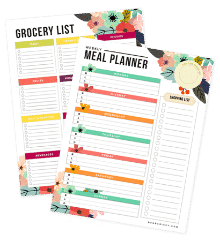 This is the post that I have been thinking about making since the day my kid was born, and yes, I actually sit around thinking about future blog posts (not to mention obsessing over 1st birthday party ideas), I am that lame. I am currently fighting the urge to type a novel reminiscing about how this day played out last year, because as you moms know, it’s just really cool to think back on the day you gave birth to your baby, but I am not going to go there. I’m going to skip that part, because I want to focus on the awesomeness of Evan’s 1st birthday party, and also because I want to try to avoid crying. 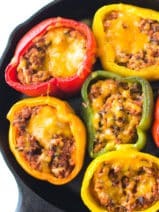 Looking for some great 1st birthday party ideas? 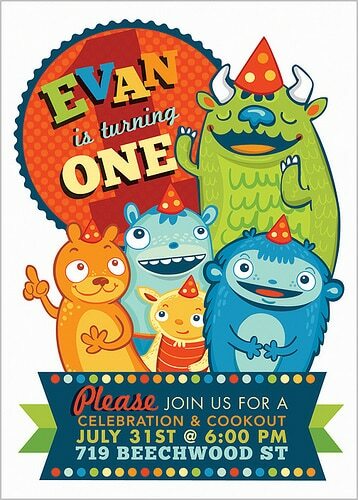 Here are the 1st birthday party invitations that we sent out, designed by the amazing Irene Silva of DoodleFactory. 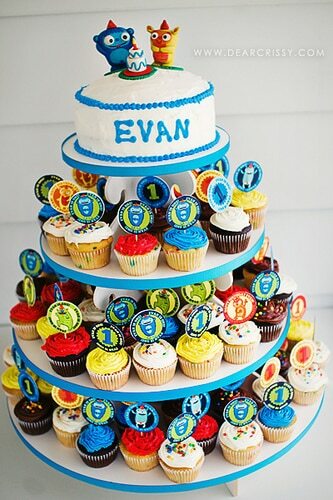 Irene also designed the cupcake toppers and made the topper on Evan’s cake. I’ve known Irene online for several years, and when she said that she would design these components for E.’s 1st birthday party I knew she would do an amazing job. I was right! 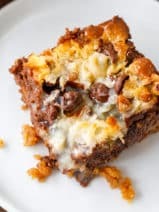 I am new at this mom thing, and certainly not a professional party planner, so I decided to focus most of my attention to the cake, because in my mind the cake was always the centerpiece of the entire party. In addition to the awesome DoodleFactory creatures to adorn the cake, the other amazing piece of the cake puzzle for me was our cupcake tower from you guessed it, The Cupcake Tower. I could not be happier with the stand that I received from The Cupcake Tower. I knew that I wanted to create a striking presentation with Evan’s cake, and wow, this custom cupcake stand really turns your cupcakes (cupcakes and a cake, in my case) into a focal point for your party. When it was time for the guests to dig in, Zach shouted, “OK, the cupcake bar is open!”. So fun! The Cupcake Tower is also incredibly strong, made of mdf with a thin laminate coating that makes cleanup a breeze. I am sure that I will be using this product for years to come, and I am so glad that we went this route for Evan’s 1st birthday party. Oh, and notice the blue ribbon on the edges of each layer of The Cupcake Tower? This is a ribbon kit, and they sell lots of different colors, so you can change up the entire look of your stand with each use! 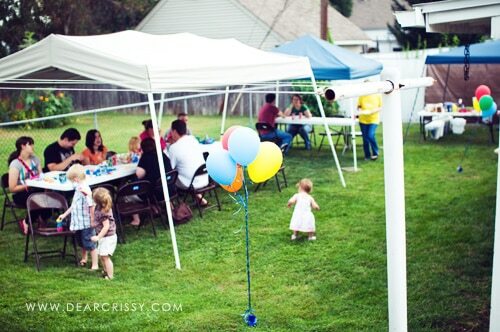 We held the Evan’s 1st birthday party in my parents backyard, and fed guests a simple classic assortment of cookout foods, including hamburgers, hot dogs, potato salad, etc. I also made fresh fruit skewers that the kids really loved. 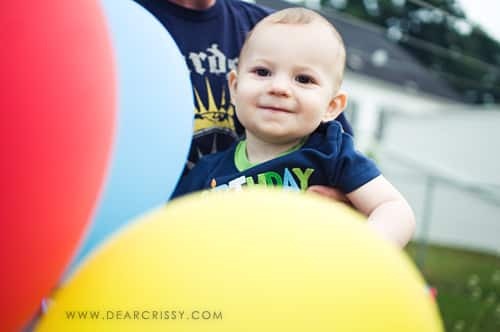 As always, we wondered how Evan would handle all of the excitement of his 1st birthday party, but he actually really loved watching all of the other kids run and play, and wanted so badly to get in on the action too! The decorations were insanely simple (like I said, my main focus was the cake). In fact, I just bought an inexpensive little helium tank from Walmart and we placed a few bright clusters of balloons around the back yard. The party favors were all from the Dollar Tree, but got the job done, and I provided the other kids with bubble wands as favors so they would have something to play with during the cookout. My entire family prayed that somehow we would be blessed with a freakishly cool day, since the previous week had brought temperatures nearing 100 and high humidity, and by golly somehow we got it. There was a little rain earlier in the day, but it was beautiful and around 83 degrees during Evan’s party–amazing! 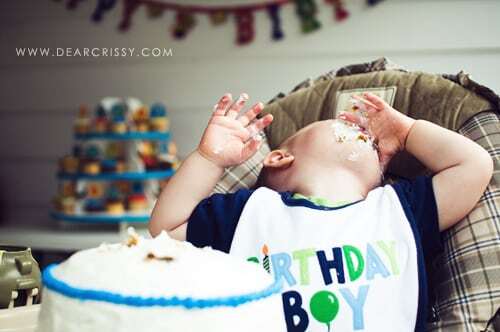 Of course, I have to give you a little play-by-play of Evan enjoying his birthday cake. 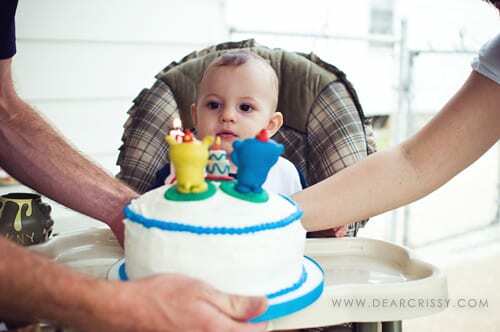 We wondered how he would take to the cake-eating, since he doesn’t really love getting sticky foods on his hands, but he came around and really enjoyed it after getting started. First, Daddy tries to show him how good it is. After some consideration, he was pretty into it. Of course, next we were on to the gift opening, which for a 1-year-old with a short attention span is just a quick flurry of wrapping paper and bows. He has been really enjoying all of the wonderful toys he received since the party, but during the opening process, he was particularly fond of this puppy! Though it was an emotional milestone, I didn’t cry at the party like I thought I would. It’s so heartbreaking to see your little baby growing and maturing each day, but of course, it is also a beautiful sight. My life is so full and rich since having Evan a year ago, and I truly feel like motherhood suits me to the core. Evan is the most precious, incredible, smart, sweet, gorgeous kid that I have ever known, and I feel so amazingly lucky to have the pleasure of being his Mama. What a wonderful 1st birthday party for our sweet angel. You always take such beautiful pics- and goodness that boy is growing like a weed (I know an old lady thing) He is such a cutie. LOVE this party. I just discovered your site through picket fence blogs. 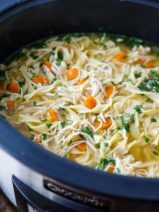 I host a party inspiration blog and would love it if you would list this party on the site so that others can be inspired by it! I'm linking the website where it says to on the comment form. Awesome photos! That cupcake tower with the cake on top….TOO CUTE!!!! I like your cupcake display for your son's 1st birthday. When my son turned 1 in May, I had a turtle themed party and had a really cute display. 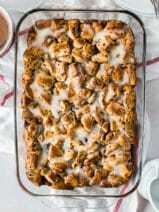 I posted a slideshow on our family blog. Cute cupcakes! Those invitations are ridiculously cute. As is your boy. It looks like he had a great, full birthday. It lokos like it was a great day! I love the little monster theme and that cupcake tower is to die for! Great job mama!! Fabulous party! You should be proud of making it the first year! I think it's the toughest one. It just gets better from here! Lovely party, and beautiful boy :) Happy birthday to Evan and congrats on surviving the first year!! Everything was JUST RIGHT… the cupcake tower not only looked wonderful but TASTED wonderful too. HAPPY 1ST BIRTHDAY EVAN!!!! Happy Birthday Evan!! 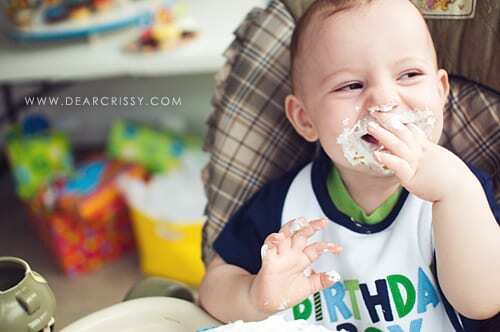 Everything looks wonderful, I love the pictures when he´s eating the cake! SO CUTE! I can’t believe they are turning one! The cupcake tower was beyond adorable! 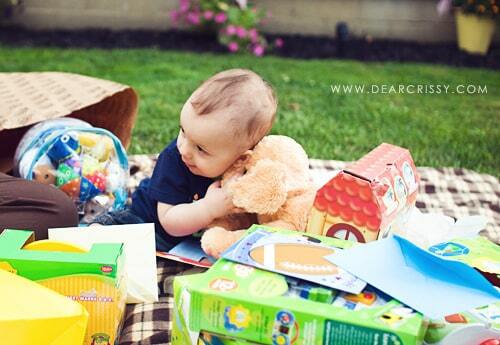 It looks and sounds like the perfect first birthday party! Love the cake. And it looks like Evan really enjoyed himself. The first year flies by, but so do the rest. 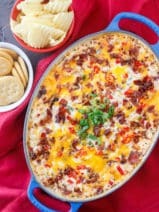 You have many more fun parties to look forward to! 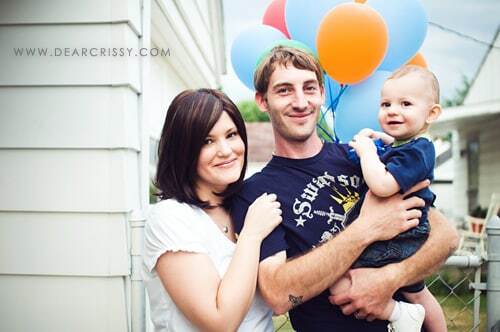 LOVE that last picture – great family photo! You did a great job – that cupcake tower looks great! Happy Birthday Evan! His cake looks delicious. His party looked like a lot of fun. Good Job Mama! 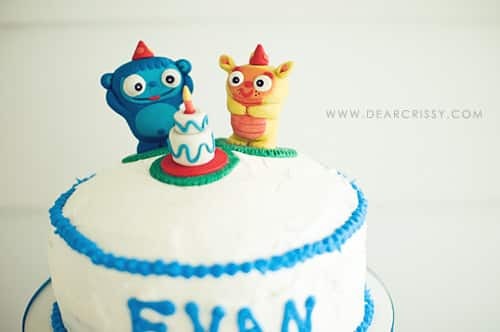 Happy birthday little Evan! Your life will only get more fun and wonderful from here on out! LOVE the cupcake tower! Looks like a fun birthday party! The pictures are wonderful. Happy birthday Evan! !